I was pleasantly surprised by this. The writer Joe R. Lansdale (who amongst other things has written for Jonah Hex and the film Bubba Ho-Tep) updates the Robert E. Howard tale of terror 'Pigeons from Hell' in a four part adaptation from Dark Horse. 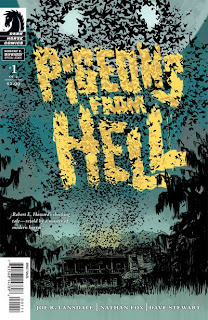 Set in the deep south, 'Pigeons from Hell', despite the unlikely title, tells the creepy story of an old house with a wicked past whose spirit of malevolence affects all who enter it. Ancestors of slaves who inherited the house come to claim the property and land with a few friends, and almost immediately we are pitched into a 'teens in peril' scenario in a haunted house. When one of the party injures themselves, their attempts at leaving the house and its land are ill-fated. Another top notch adaptation, folowing on from 'Evil Dead'. Verdict - A solid creepy tale. Nice atmospherics. Worth seeing where this one goes. 7 out of 10.